With every season seemingly comes the desire to reflect and improve, to learn and to experience. There's something extra special about autumn that makes you want to start fresh or to immerse yourself in something brand new. Maybe it's because it's so beautiful outside or maybe it's just the contagious energy in the air--whatever it is, we all want a piece of the excitement. Even though fall flies by, we all have the unique opportunity to try something new or to create lasting memories in an effort to discover and be our best selves. There are endless activities to pursue and skills to learn, but here are 10 Ways to Turn Over a New Leaf this Fall. Even if you're pretty crafty, knitting can seem intimidating--at least it was for me. Ease your way into it by picking up a knitting loom. I find this method of wrapping yarn and overlapping with a hook very relaxing, productive, and enjoyable. Knit to calm your mind while catching up on Scandal or listening to a TED talk and suddenly you'll find yourself with an infinity scarf! Pick up a loom for five bucks and follow this easy tutorial to get started. Nanowhat? National Novel Writing Month, that is! Join hundreds of thousands of other writers to write 50,000 words of a rough draft between November 1-30. Sound intimidating? Well, yeah. It is. But that doesn't mean it's not worth it. Don't stress. You'll be supported by a tight-knit community, challenge yourself in a multitude of ways, and churn out a huge chunk of that novel that's been writing inside of your head for years. Read up on Chelsea's tips to prepare for the madness. We all know that spring cleaning exists, but I'd argue that fall cleaning is equally as important for improving your quality of life when it comes to stress, productivity, and even spending habits. Take this time to take honest stock of your possessions and clothing. Apply these spring cleaning tips to your fall closet, adopt a capsule wardrobe, and/or sell some of your items to make it sting a little less. You'll feel freer, richer, and happier with your carefully curated closet. Hear me out. This is more than just giving yourself an excuse to get sucked into the world of Pinterest and then emerging hours later with a million boards and nothing to show for it. That may indeed happen, BUT there is a deeper purpose to organizing your Pinterest appropriately. First, you'll give yourself the opportunity to sift through the impulsive pins and keep only what is really relevant or interesting to you. I found that a lot of what I initially liked or pinned was not worth keeping because my tastes had changed or it was not practical or useful to me. Second, you'll begin to notice recurring trends to make clearer conclusions about your style, food, decor, and activity preferences. Additionally, your newly organized boards will save you time in the future when you go searching for a specific pin. After all, that's what this virtual pin board is for. And for bloggers, here are some really helpful tips that got me inspired to organize my own. A Daily or Weekly Gratitude Practice: As Britt Reints of In Pursuit of Happiness writes, "Gratitude that has a meaningful and measurable effect on our happiness is something we do." Commit to writing down at least three things you are grateful for each day or each week and be cognizant of how it affects your attitude and general wellbeing. Read up on Angelica's take on the gratitude practice. A Surprise Journal for A-Ha Moments: Julia Galef hit home when she stated, "It’s so easy to see the silliness in other people’s thinking, but so hard to see the problems in our own" in this Fast Company article. In an effort to identify her wrongful assumptions about people and situations, she created the surprise journal which she kept with her at all times to write down anything she was surprised about. These discoveries may illuminate, teach, and re-frame what may otherwise be painful, confusing, or ignored. Read more here. Wreck This Journal: For my more artsy and non-writing friends, this quasi-sketchbook journal is for you. Get creative, don't overthink it, just follow the instructions and enjoy. This may be the one journal you actually finish! Check out this video of a completed Wreck This Journal. I know I'm a little (a lot) biased in expressing my wholehearted support of this method of turning over a leaf this fall, but it's SUCH a great way to push yourself way out of your comfort zone, learn a new skill, get some exercise, and make new friends. I've been taking swing dancing lessons (for FREE) for a few months now and it is easily one of my most favorite things in the world. I've talked before about not holding back when it comes to pursuing your secret interests, even when nobody will accompany you. Go anyway. It always pays off. You can find tons of free or inexpensive dance classes in your area. If you're feeling serious about taking professional classes, check Groupon for discounts. If dancing isn't your thing, give spinning a try. Whether you're job searching or settled into a solid career, it's always a good idea to branch out and attend networking events. You'll keep your elevator pitch fresh, learn about new opportunities, make new connections and friends, and reevaluate your current professional (and personal) status. If you're not sure where to get started, search for a local Levo League chapter in your city. Levo is one of the main reasons I was able to transition back home and into a completely new career with confidence and hope. Not only did I learn about negotiating a salary, create realistic goals for now and for the future, and gain connections that would lead to a new job, but I also made some really great friends. I served as part of the leadership board from February through September and I am so grateful for the opportunities it brought me and so many others. Want to ease into a networking environment without the initial awkwardness? Attend a volunteer event organized by a networking group. Before it's too cold to wear anything but a giant cocoon of blankets, dedicate yourself to a fitness routine that works for you. What's equally important is to foster and maintain strong participation in an accountability group. Back in September, I took part in a fitness challenge and joined a supportive Facebook group. Without this accountability, I would not have been nearly as dedicated. It ended up being bad timing in general, but I now know that having at least one person who commits to supporting you (and you support them in return) is the key to success. Need some ideas? Hang out with Jillian Michaels for 30 Day Shred, queue up Blogilates, check in with Tone It Up, create your own workout from The Almond Eater's tutorials, attend a Zumba, barre, or spin class, or get started with the Couch to 5K app. Challenge yourself to choose something not on your "Want to Read" bookshelf on Goodreads. An easy way to start is by selecting a genre you don't typically read and searching your friends' recommendations and Barnes and Noble's top picks or selecting a medium you don't usually gravitate towards (perhaps a memoir or a graphic novel). Pick up a classic you've always meant to read but never got around to. Choose a YA novel that "all the kids are reading" (or more likely watching on the big screen) and see what all the racket's about. Seeking a loophole? Try a non-fiction book on professional or personal development. I recommend Choice Theory, Daring Greatly, and The Defining Decade. Follow Modern Mrs. Darcy (I know, right? She's got great taste.) for fantastic book reviews and recommendations from her highly-respected Autumn Reading List. Whether you try one of these activities or engage in them all, you're bound to discover or enjoy something new and uncover new knowledge about yourself along the way. This is not an exhaustive list; there are so many more things you can accomplish or try this fall! 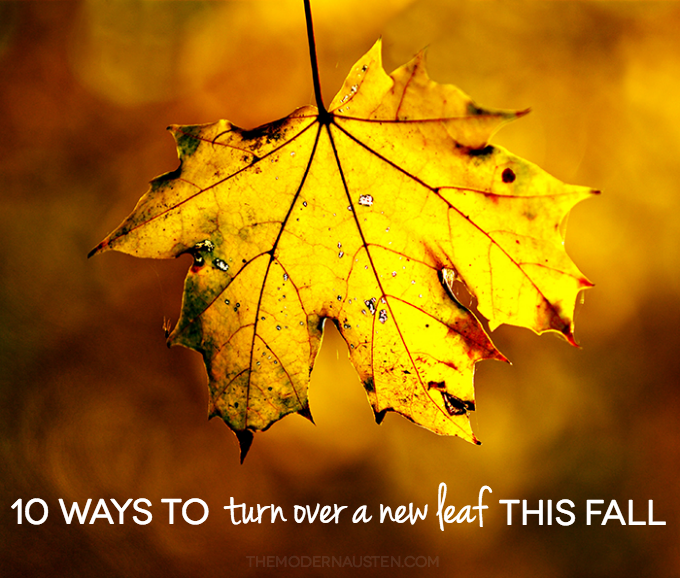 How will you turn over a new leaf this fall?What activities or skills would you suggest to your friends and family to explore ourselves more fully and have a heck of a lot of fun along the way?